This is a story about holiday traditions, specifically the one about being “home,” which is not as simple as it sounds. As long as we draw breath, and grow, and allow ourselves to be touched by others, our experience of “home” will change. Guaranteed. 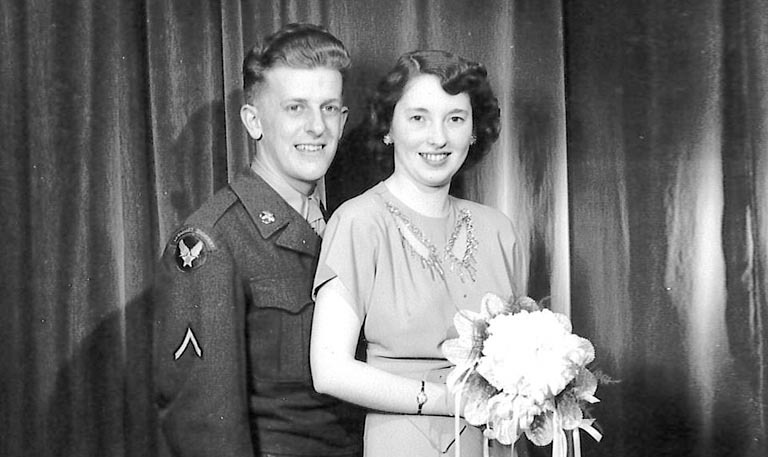 Just 21 days after childhood sweethearts Bob and Shirley King married, Bob left for a two-year tour on Okinawa, Japan, with the U.S. Air Force. It might as well have been the moon. Coming home for Christmas was impossible, and telephone calls from the island to the U.S. were too expensive. “It was not an auspicious way to start a marriage,” King says today. “But I made a choice, and my wife agreed, that I would make my life in the service and we would accept the circumstances.” For the next 25 years, the couple were apart during the holidays more often than not. In the Bing Crosby hit I’ll Be Home for Christmas, a homesick soldier says he’ll be there “if only in my dreams.” The Kings could relate to that. By 1956, King was serving as a navigator bombardier on the Boeing B-47s. Trans-Atlantic training flights were almost 12 hours long, and it wasn’t unusual to fly on holidays. The crew would bring along their holiday meals prepared on the base, with each dish wrapped individually in aluminum foil. King recalls stashing the hot dishes inside the boxes holding the plane’s electronic equipment. That way, the food would stay warm until he finally had a moment to eat in flight. When King retired, he and Shirley took to the road in an RV for 16 years. Their holiday meals consisted of potluck dinners with fellow RV travelers, which King describes as “the most friendly, congenial group of people you could ever hope to meet,” and home was wherever they’d feast together. For the past eight years, the couple has lived at Garden Court, a retirement community in Everett. They enjoy being close to their children and grandchildren, and Bob is working on his memoirs, which he hopes to publish. The family rotates holiday celebrations between the homes of Bob and Shirley’s two daughters, who live close by, and Garden Court, where they eat and exchange gifts in either a private dining room or in the community dining room. For the King family, “home” is an experience, not a place. “The important thing is just being together,” Bob King says. For many of us, the “home” Crosby sings about is really just one ideal, and one that’s sometimes impossible to experience in real life. What if we reinterpret the last line, if only in my dreams, as simply an acknowledgement of that ideal, rather than as a sad and lonely ending? After all, as the Kings have demonstrated, home can change as we move through life, and holiday traditions evolve with time. Ultimately, it is the home within us that brings about the most joy and meaning. When she was a young mother, Toni Davis of Ashland, Oregon, worked to the point of exhaustion to create the picture-perfect Christmas. Looking back, she realizes she was so busy preparing that she missed some precious moments: simply sitting to look at the lights on the tree, or reading a Christmas story to her children. Char Horning of Mariposa, California, describes her younger self as “caught up in the external culture.” It wasn’t until her 50s that she became more aware of her inner, spiritual life. Now, before family gatherings, she spends time in quiet meditation, reflecting upon the needs of each person, including herself, and considering what she wants to communicate. At the table, before the traditional grace is recited, she asks for a few minutes of silence to allow each person to “open up to the divine presence” in their own way. She is mindful that she is her grandchildren’s only living grandparent, and she wants to model, but not dictate, a spiritual practice. As King, Davis, and Horning attest, we are never truly “home” until we experience peace within ourselves, and authentic connections with others. Over the holidays, most of us try harder—and hopefully edge a little closer—to this ideal. 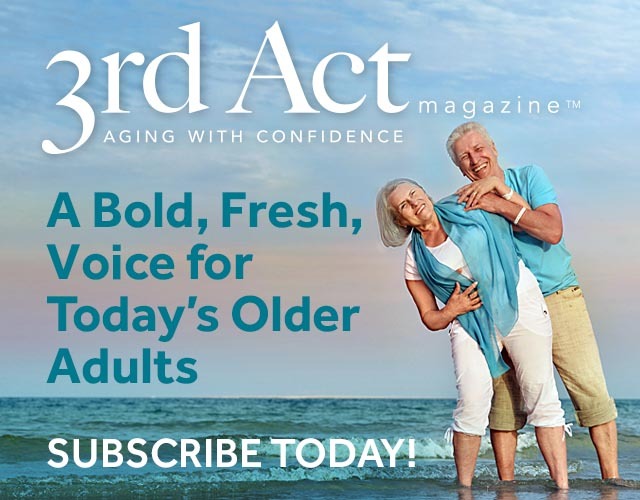 Older people are better at this, it seems. But then again, we’ve had more years to practice. Teri Thomson Randall is a journalist, photographer, and filmmaker residing in Seattle. Her writing experience spans the arts and sciences, including staff writing positions at the Journal of the American Medical Association and Pasatiempo, the weekly arts magazine of the Santa Fe New Mexican. She holds graduate degrees in microbiology, science communication, and film production.